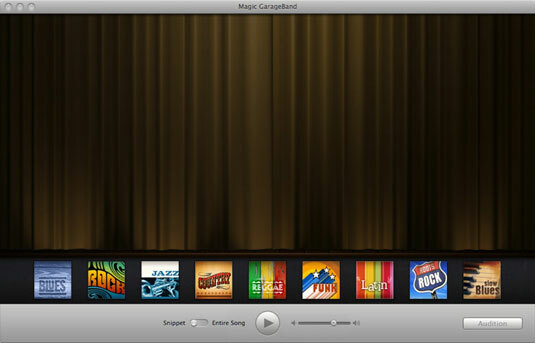 If you’re not a real musician or composer, Apple had you in mind when it added its new Magic GarageBand feature to GarageBand. The idea is to let you conduct a virtual band. 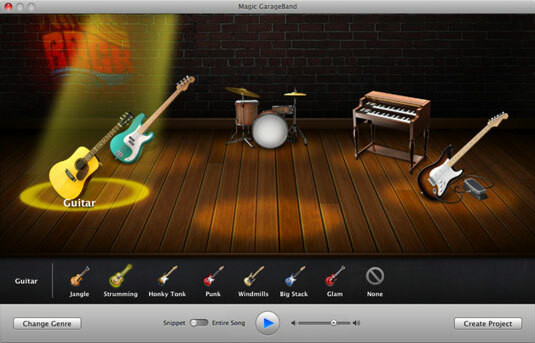 When you choose Magic GarageBand from the opening GarageBand menu, you see the stage shown in the figure. Below the closed curtain are nine icons, representing Blues, Rock, Jazz, Latin, and other styles of music. You can preview a song snippet or the entire ditty in the genre of your choice by clicking Play and choosing Snippet or Entire Song. Click the Audition button to see the instruments used in the song. You can change one or more by clicking an instrument to select it — every time you mouse over a different instrument, a spotlight appears over your selection. Choose an alternative instrument from the list below the stage. When your virtual band is just as you like it, click Create Project. The regular Garage Band window takes over, with appropriate tracks and regions for your selections.